I was sitting here looking at the title of the comic and realized that I have drawn over 646 pages of one story. I don’t plan to stop either. I am in awe over how this story has evolved and how I have grown as human being because of it. A tale of dishwasher, who now finds himself in a cold dark world carrying a sword that is fighting to control him. The coloring has been a new motivator for me. I know the transition has been tough for some, but I also know that the story is soooo much better because of it. I don’t know where my future is on the books at the moment. (Don’t worry I am not stopping the story and it does have an ending) I just don’t know if I will be able to speed the timetable up or if I will be stuck at 2 pages a week (front and back) for a long time. As you can see I am determined and I am not giving up. I really enjoy telling this tale. I love where it is going and I love that I am a part of it. I am also happy that I am able to share it with you. I am supper appreciative of how several of you are supporting it on a monthly basis. You are helping me find more time to keep it going. Thank you so much for what you are doing. You don’t have to I know, but I am so grateful that you do. If i get this set up right I will be able to update the bean 5 times a week. 🙂 But that is going to take a little extra support from you as well. So for now, I can only manage one new page to the story and old page of the story colored. I just have a family to feed:) I would though ask if you enjoy this tale to help share it. We can use all the help we can get. I also am grateful for my supportive family. They have watched this tale grow and struggle. I am a lucky man to have them as they deal with late nights of me drawing comic pages and creating this wonderful tale. The desperation in the last panel is almost palpable. That dead-eyed expression in the woman's face especially really hits me. Theron's first sentence could use a modification. The question mark could be changed to a comma or 'have a reputation' could be 'they've a reputation'. 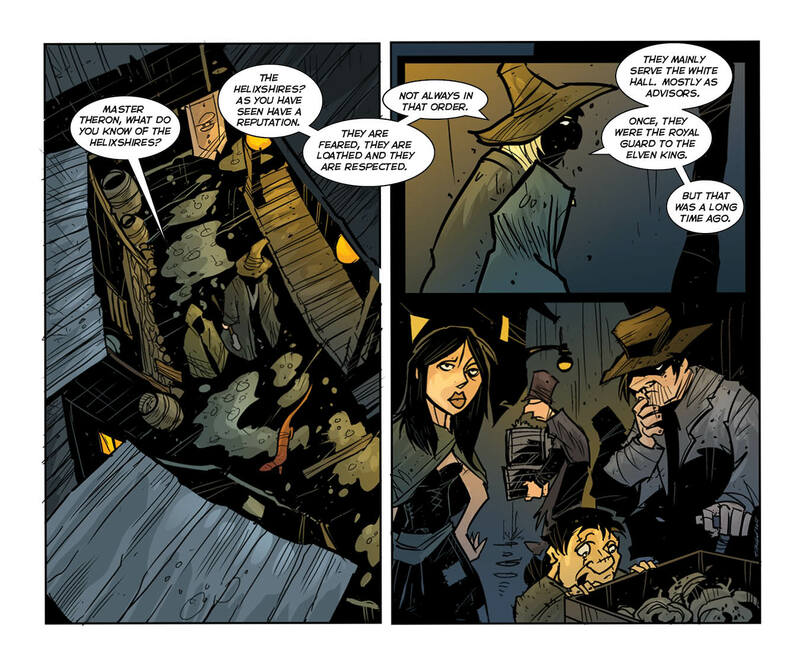 I loved the last panel, a great rogues gallery of back alley denizens.